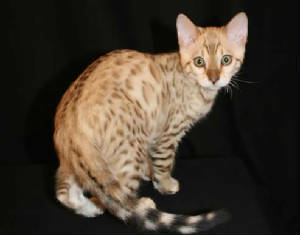 I have created this page as a way to showcase the unique features that we get with our (Meaning all Bengal breeders) Bengal kittens. Every now and then we have a kitten born with a special pattern, a picture we see in the pattern (Like pictures in the clouds) etc... Feel free to email me pictures you may have of past kittens. Please include your name, cattery name and registered name of the kitten if known.